Background Sometime between the late 1960s and the early 1970s, goldfish wholesale store, Shimizu Goldfish, in Hamamatsu, Shizuoka Prefecture, imported from Hong Kong the Pearlscale, which develops a lump on its head. After that, fish famer Shigeo Watanabe, who lived in Gamagori City, Aichi Prefecture, bred them. 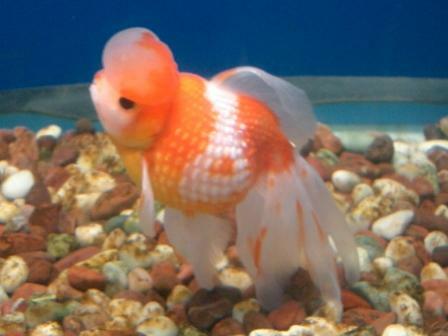 Through a selection and settling process, goldfish which have a bubble-like lump on its head are named ‘Crown Pearl’ (some people believe that the Crown Pearl came into existence by cross-breeding the Pearl and the Bubble Eye but this is wrong). Towards the end of the 1970s, a few Crown Pearls appeared on the market. In 1978, they were introduced to the public as a new type of goldfish: the ‘Crown Pearl’. The ‘Hama’ in ‘Hamanishiki’ (‘crown pearl’ in Japanese) is derived from Hamamatsu, the city in which the Shimizu goldfish wholesale store was located. Features Its greatest feature is the bubble-like lump that develops on its head (the lumps are not filled with liquid like the Bubble Eye, but are actual lumps). Its body shape and pearl scales are the same as those of the Pearl. Crown Pearls are obviously different amongst goldfish produced in Japan. Acquisition difficulties Difficult. The rate of distribution is low so they are difficult to acquire. Rearing difficulties Somewhat difficult. The Crown Pearl has a unique nature and features, and is not constitutionally strong. Details of the above photo The Crown Pearl in the photo is the goldfish that was displayed at ‘Goldfish Hall’, located in the town of Nagasu, Kumamoto Prefecture (a goldfish breeding district in Kyushu). Its lump, the Crown Pearl’s unique feature, is well-balanced, and its pearl scales are easily recognised. Other In Japan, only the Crown Pearl and the Pearl have pearl scales, however, in China, there are various types of goldfish which have pearl scales.